ADD A TOUCH OF SOPHISTICATION WITH THIS CLASSICALLY STYLED WHITE ROUND PLATE WITH A PLATINUM BAND. TAKE THIS ELEGANT LOOK UP ANOTHER NOTCH BY ADDING A SILVER CHARGER PLATE. AVAILABLE: DINNER, SALAD AND CAKE/APPETIZER/B&B, COFFEE CUP AND SAUCER. 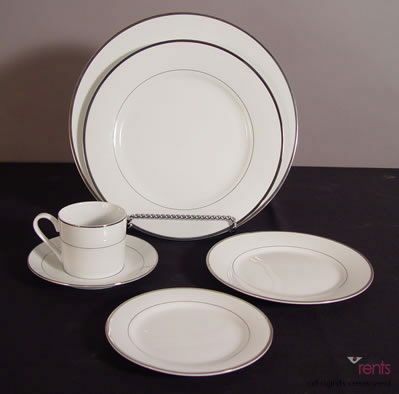 * Please call us with any questions about our white platinum trim china rental in Baltimore Metro area.